As with the previous two islands that we visited in recent days, St. Maarten was also struck by hurricanes Irma and Maria in 2017. Some of the saints on the island lost their homes, and our rented church facility in Sucker Garden was completely destroyed. In contrast, our Bishop Hill church, which was under construction and has been built well, sustained no damage. The finish work had not begun, but even so, many structures thought to have been strong did not survive. The congregation was able to move their services to the partially completed building as construction continued. The dedication ceremony was held on Sunday, March 17, and began with the Haitian National Anthem followed by the St. Maarten National Anthem, and a selection from the choir. Rolland Deler, the Haiti District Superintendent who also oversees the St. Maarten work, welcomed everyone, recognizing the visiting guests, including our team. Michael Anthony, the Eastern Caribbean District Superintendent, also greeted everyone, and he gave a Scripture reading. Remarks were made by the Bishop Hill (and previously Sucker Garden) pastor, Fecu Commandant, and Deivys Pichardo, the Dominican Republic District Superintendent. We enjoyed two specials by the young people, and a Scripture reading from Psalm 136, which was given by the pastors of the other two churches on the island: Emeric Jerome from Cole Bay and Eugene Hodge from Sandy Ground. The dedicatory prayer was given by Tim DeBusk, Director of Caribbean Work, and then Brother Rolland spoke on how the Bishop Hill church came to be built. The Sucker Garden congregation formed in 1991. Nine years later, they received a notice to vacate the building so the property could be developed. Brother Rolland, who was once the Sucker Garden pastor, took the notice to the altar and laid it before the Lord. He prayed, asking that God provide the Apostolic Faith with land and a church building on St. Maarten for the sake of future generations should He tarry. Two years later, the Bishop Hill property was posted for sale. We made an offer and it was accepted, but at the closing, the seller raised the price, so we walked away. At that time, Brother Rolland made the bold statement to the owner that because God wanted the property, he would not be able to find another buyer. This proved to be true, and six months later, the property was sold to us. 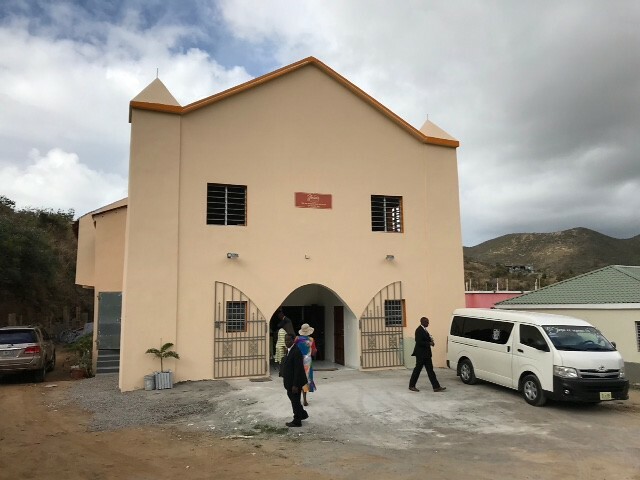 The building has been under construction for the past fifteen years, and though some work remains to be done, the vision of an Apostolic Faith-owned church on St. Maarten has come to pass. We now own a beautiful church. The dedication service was a celebration for the saints, and we rejoiced with them.